I need to say thank you to lots of people today but I don’t know who they are exactly. 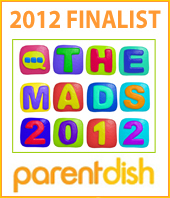 I found out yesterday I’m a finalist in the MAD (Mum and Dad) Blog Awards 2012 in the Best Food Blog category. I was supposed to be working at home yesterday but I guess I was looking for distraction and found myself on the MAD website. When I saw a little screen shot of the Bangers & Mash blog on the MAD finalists page I literally started shaking with excitement and disbelief. Really? Me? But I’m not a proper blogger. I can’t compete with the big boys (and girls) – can I? I was supposed to do so much work yesterday, my one day at home all week, but that all went out the window. I called my Nana Barbara straight away because I had to tell somebody. Oh yes, I did call one of my best friends before her but that went to answer phone and I left a very silly garbled message involving lots of squealing. And then I called Nana because I knew she’d be in and because she is one of my food heroes. She’s probably the only person in my family who knows how to bake, and I love our conversations about food. And her reaction was just perfect. I’ll always be the little grand-daughter who loves to make her Nana proud. But back to saying thank you. People had to nominate the Bangers & Mash blog in order for it to be considered for a MAD award. However I have no idea other than my closest friends and family members who actually did this, so I want to throw a big thank you out there and hope that if you did nominate me this reaches you. Why oh why though, when I try to think of ways to say thank you, do I come back time and time again to this corny advert from the British 1980s TV vaults? This was an ad for Cadbury’s Roses chocolates and I know it’s cheesy but somehow it remains the perfect way to say thank you. Those ad men in the 80s knew how to make an advert that would remain with you for the rest of your life didn’t they? My children embarrassingly know the words to the Finger of Fudge (a finger of fudge is just enough until it’s time to eat) and Club (if you like a lot of chocolate on your biscuit join our club!) songs, despite never having seen the original adverts. And only last week I was having a nostaligia-ridden conversation on Twitter remember lyrics to the Um Bongo and Ki-Ora adverts. Ah, they don’t make ’em like they used to ‘eh? But as ever I’m waffling on. Thank you whoever and wherever you are for nominating me for the MAD Blog Awards. If you happen to want to show me some support yet again you can now vote for me to win the whole blooming category. But considering I’m in the last five from more than 130 nominations, I’m really rather chuffed with how far I’ve got already. I’ve got a posh awards ceremony in London to go to in September with cocktails and a three-course meal and everything, so to be honest I couldn’t be happier. WooHoo!! CONGRATS! I’ll go vote right now! Good Luck!